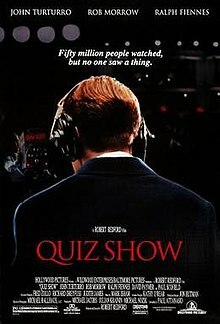 Quiz Show is a 1994 American historical film produced and directed by Robert Redford, and written by Paul Attanasio, based on Richard N. Goodwin's memoir Remembering America: A Voice From the Sixties. It stars John Turturro, Rob Morrow and Ralph Fiennes, with Paul Scofield, David Paymer, Hank Azaria and Christopher McDonald appearing in supporting roles. The film chronicles the Twenty-One quiz show scandals of the 1950s, the rise and fall of popular contestant Charles Van Doren after the fixed loss of Herb Stempel and Congressional investigator Richard Goodwin's subsequent probe. Goodwin co-produced the film. The film received generally positive reviews and was nominated for several awards, including a Best Picture Oscar nomination and several Golden Globe Awards. It had a disappointing box office return. In 1958, the questions and answers to be used for the latest broadcast of NBC's popular quiz show Twenty-One are transported from a secure bank vault to the studio. The evening's main attraction is Queens resident Herb Stempel (John Turturro), the reigning champion, who correctly answers question after question. However, both the network and the program's corporate sponsor, the supplementary tonic Geritol, find that Stempel's approval ratings are beginning to level out, meaning the show would benefit from new talent. Producers Dan Enright (David Paymer) and Albert Freedman (Hank Azaria) are surprised when Columbia University instructor Charles Van Doren (Ralph Fiennes), son of a prominent literary family, visits their office to audition. Realizing that they have found an ideal challenger for Stempel, they offer to ask the same questions during the show which Van Doren correctly answered during his audition. He refuses, but when he comes within reach of a game-winning 21 points on the show, he is asked one of the questions from his audition. After a moment of moral indecision, he gives the correct answer. Stempel, having been promised a future on television if he takes a dive, deliberately misses his chance at reaching 21 by incorrectly answering one of the show's easiest questions. In the weeks that follow, Van Doren's winning streak makes him a national celebrity, but he buckles under the pressure and allows Enright and Freedman to start giving him the answers. Meanwhile, Stempel, having lost his prize money to an unscrupulous bookie, begins threatening legal action against NBC after weeks go by without his return to television. He visits New York County District Attorney Frank Hogan, who convenes a grand jury to look into his allegations. Richard Goodwin (Rob Morrow), a young Congressional lawyer, learns that the grand jury findings have been sealed and travels to New York City to investigate rumors of rigged quiz shows. Visiting a number of contestants, including Stempel and Van Doren, he begins to suspect that Twenty-One is a fixed operation. However, Stempel's volatile personality damages his credibility, and nobody else seems willing to confirm that the show is fixed. Fearing Goodwin will give up the investigation, Stempel confesses that he was fed the correct answers during his run on the show, and insists that Van Doren must have been involved as well. Another former contestant gives Goodwin a set of answers that he mailed to himself two days before his quiz show appearance, which Goodwin takes to be corroborating evidence. Van Doren deliberately loses, but NBC offers him a lucrative contract to appear as a special correspondent on the morning Today show. The House Committee for Legislative Oversight convenes a hearing, at which Goodwin presents his evidence of the quiz show's corruption. Stempel testifies at the hearing but fails to convince the committee, and both NBC network head Robert Kintner (Allan Rich) and Geritol executive Martin Rittenhome (Martin Scorsese) deny any knowledge of Twenty-One being rigged. Subpoenaed by Goodwin, Van Doren testifies before the committee and admits his role in the deception. After the hearing adjourns, he learns from reporters that he has been fired from Today and that Columbia's trustees are going to ask for his resignation. Goodwin believes he is on the verge of a victory against Geritol and NBC, but realizes that Enright and Freedman will not jeopardize their own futures in television by turning against their bosses. He silently watches the producers' testimony, vindicating the sponsors and the network from any wrongdoing, and taking full responsibility for rigging the show. Journalist Ken Auletta, in a 1994 article in The New Yorker, noted that Redford conceded at a screening of the film that summer that "dramatic license" was taken in making Quiz Show. Redford made no apologies for the liberties, which included telescoping three years of scandal into one. Redford stated that he had tried "to elevate something so that people can see it ... otherwise, you might as well have a documentary." Redford noted there had already been a documentary on the scandal, referring to the Julian Krainin-produced work for a 1992 installment of the PBS series The American Experience. In a July 2008 edition of The New Yorker, Van Doren wrote about the events depicted in the film. He agreed with many of the details. But he also said that he had a regular girlfriend (his future wife) at the time he was on Twenty-One, and that she was not present in the film depiction. Van Doren also noted that he continued teaching, contrary to the film's epilogue which stated he never returned to doing so. The film opened in limited release on September 14, 1994. After its initial run, the film grossed a domestic total of $24,822,619 and was a box office bomb. The film currently holds a 96% rating on Rotten Tomatoes. Film critic Roger Ebert gave the film 3 1/2 stars out of four, calling the screenplay "smart, subtle and ruthless." Web critic James Berardinelli praised the "superb performances by Fiennes", and said "John Turturro is exceptional as the uncharismatic Herbie Stempel." Writing for Entertainment Weekly, Owen Gleiberman highlighted the supporting performance of Paul Scofield as Mark Van Doren, stating that "it’s in the relationship between the two Van Dorens that Quiz Show finds its soul." Paul Scofield was also nominated for the Dallas–Fort Worth Film Critics Association Award for Best Supporting Actor, the National Society of Film Critics Award for Best Supporting Actor, and the New York Film Critics Circle Award for Best Supporting Actor. John Turturro was also nominated for the Screen Actors Guild Award for Outstanding Performance by a Male Actor in a Supporting Role, and the Chicago Film Critics Association Award for Best Supporting Actor. ^ Box Office Information for Quiz Show. The Wrap. Retrieved April 4, 2013. ^ a b "Quiz Show (1994)". Box Office Mojo. Retrieved 2010-07-28. ^ a b "Quiz Show". Turner Classic Movies. Atlanta: Turner Broadcasting System (Time Warner). Retrieved July 4, 2016. ^ Goodwin, Richard N. (2014). Remembering America: A Voice from the Sixties (Paperback ed.). New York City: Open Road Integrated Media. ISBN 978-1497676572. ^ David Ansen (September 18, 1994). "When America Lost Its Innocence--Maybe". Newsweek. ^ Maslin, Janet (September 14, 1994). "QUIZ SHOW; Good and Evil in a More Innocent Age". The New York Times. ^ a b Auletta, Ken (September 19, 1994). "The $64,000 Question". The New Yorker: 48. ^ Van Doren, Charles (July 28, 2008). "All The Answers". The New Yorker. Retrieved May 8, 2013. ^ "Quiz Show, Rotten Tomatoes". Rottentomatoes.com. Retrieved 2013-12-13. ^ Roger Ebert. "Quiz Show". September 16, 1994. ^ James Berardinelli. "Quiz Show". ReelViews. ^ Owen Gleiberman. "Quiz Show", Entertainment Weekly. ^ "The 67th Academy Awards (1994) Nominees and Winners". Academy of Motion Picture Arts and Sciences. Retrieved June 6, 2018. This page was last edited on 16 April 2019, at 03:35 (UTC).